Can Singapore Airlines do luxury better than its rivals? 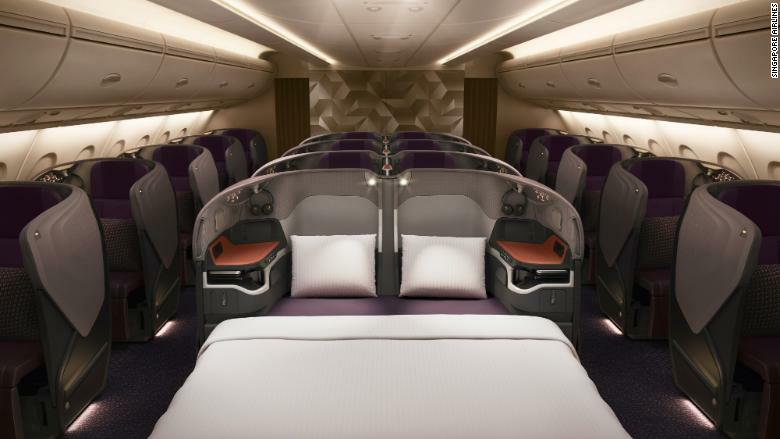 The Asian carrier on Thursday unveiled a new cabin design for its fleet of Airbus A380 superjumbo jets, featuring double beds, swivel chairs and personal wardrobes in private first-class staterooms. The new design includes six spacious suites that boast 32-inch flat-screen TVs, vanity counters and luxury leather furnishings. In business class, couples traveling together can drop the divider between seats to create a fully-reclining double bed in the center column. But a decade after it first introduced the A380 -- the world's largest passenger jet -- Singapore's own luxury standard has been leapfrogged by competitors in the Middle East like Dubai's Emirates Airline and Abu Dhabi's Etihad Airways. The Gulf carriers' first-class offerings include on-board showers, fold-away beds and sliding privacy doors. Etihad even boasts private butlers for high-flying guests on some routes. "Singapore Airlines is clearly attempting to reestablish its leadership position at the front of the aircraft," said Greg Waldron, managing editor of aviation industry website FlightGlobal. 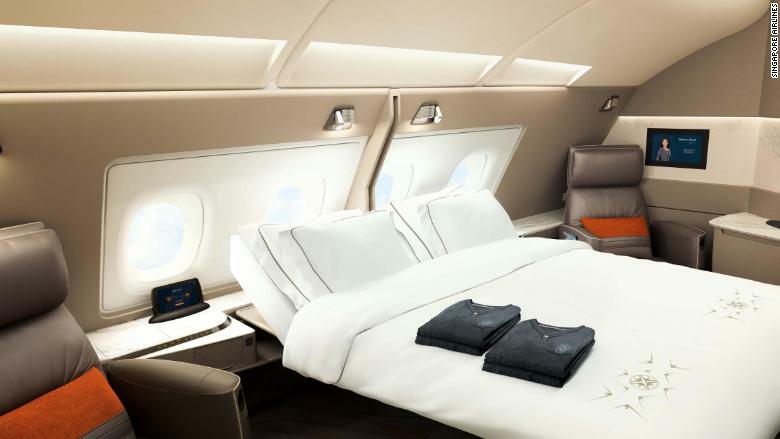 A first-class suite in Singapore Airlines' new cabin design for its A380 fleet. Corrine Png, an analyst at research firm Crucial Perspective, agreed, saying Singapore needed the redesign because its current offering "looks tired now" and rivals have caught up. The airline said it's spending $850 million on the overhaul. The airline has struggled to compete with Emirates whose prices are generally cheaper. Waldron pointed out that Singapore's new design features fewer first-class suites than its most-crowded A380 did previously -- and also has more economy seats. That should reduce the carrier's costs per passenger by adding more seats it's likely to fill. "While suites generate publicity and headlines, the ticket price is far beyond the reach of most passengers," he said. Png notes that Singapore has also focused on lighter and thinner materials in its new cabins in an effort to cut fuel costs. Related: This plane may vastly improve flying in the U.S.
Singapore's big unveil comes after a bumpy period. In May, it reported a surprise quarterly loss in the face of strong competition from Gulf airlines. The prompted Singapore Airlines chief executive Goh Choon Phong to kick off a root-and-branch review of the business. The airline swung back to profit in its most recent quarter. It's not the only Asian carrier facing turbulence. Hong Kong's Cathay Pacific (CPCAY) lost roughly $260 million in the first six months of its financial year as it tried to fend off growing pressure from mainland Chinese airlines. Business class in Singapore Airlines' new cabin design for its A380 fleet. Singapore said it plans to roll out the redesign across its entire fleet of A380s. The carrier is due to receive the first of five new aircraft next month and will also retrofit the 14 A380s it already has in service by 2020. The airline was the first to fly the superjumbo a decade ago. The A380 has had a troubled commercial history, with Airbus cutting annual production from 30 aircraft to 12 starting next year -- and then just nine in 2019. 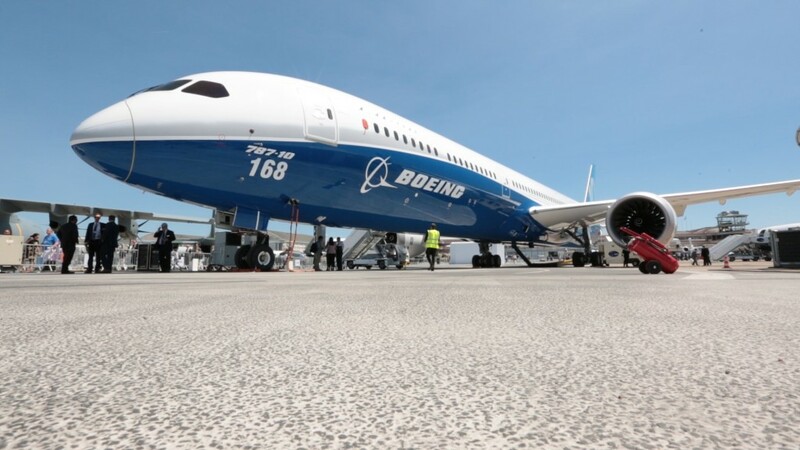 Customers have instead generally preferred smaller twin-engine aircraft like Airbus' A350 and Boeing (BA)'s 777 and 787. - Jon Ostrower contributed to this report.